The Adelaide Freecycle(TM) group is open to all who want to”recycle” that special something rather than throw it away. Whether it’s a chair, a fax or old door, feel free to post it. Or maybe you’re looking to acquire something yourself! My mobile number and any relevant information you require about my account is readily available , and will gladly answer all your questions once I know that my message is secure, and only you will see this email. 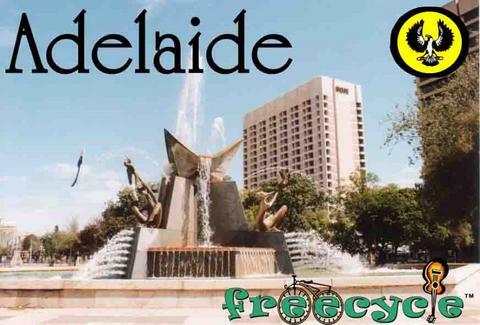 It has been about 10 years as far as I can remember since I last traded on Freecycle_Adelaide. Last time I traded my email address was different to what it is now. I had to change my email address all that time ago due to domestic violence, and I could not keep on paying for the bigpond email address. So, I went to a free one on yahoo. Adding to my challenging life, I am now 3yrs and 2months after surviving a horrific mva wher i was rear-ended. As well as the physical injuries, I also sustained a head injury. my weak area now is processing information and problem solving. I am so very gratefaul for my life. I have a toploader washing machine that i no longer need, as i have a smaller frontloader, and thought about putting this on freecycle adelaide. everything for me now takes so much longer. When I attempted to login a couple of days ago , there was a message that confused me. saying something about because I had not used my account for a long time an email would be sent to one of the previously mentioned email addresses which no longer exists and didnot know what to do. Then I attempted to create a different email address, and it said something about not being able to use my name as it was unavailable. This has confused me even more. I would like to change my user login identity as it reminds me of my abusive ex. I can tell you my password that i previously used. I think the last time i traded my address was my current address, probably traded for some treated pine logs which i used for edging my garden. Some local kids decided they liked them more, and during the last year all have been stolen. I am no longer a survivor, i am a thriver (To Have Rights I Vigourously Endure) and want to reclaim my place in society , holding my head high. Sorry I can’t help you with that, if you contact the group Administrator they should be able to help. http://www.freecycle.org I’m no longer a member either.